The Challengers Award promotes the development of innovative new technology in woodworking machinery, supplies, and services for the furniture, kitchen cabinets, architectural woodwork, store fixture, upholstery, or specialty and general wood product industries. 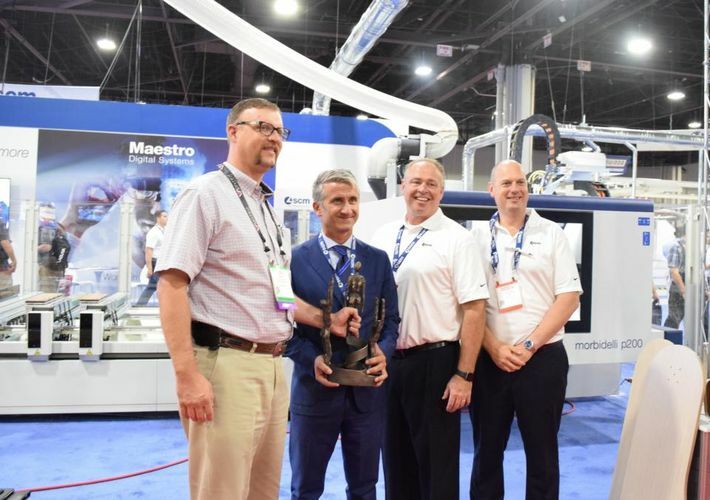 During the IWF tradeshow, SCM was rewarded for the morbidelli p200 CNC router with HE-POD Technology which can machine any type of edge in any situation. It features five independent and interpolating axes with continuous 360 degree rotation and a numerical control Z axis that allows for adjustment of the lower projection of the edge. There are no limits to the shapes that can be machined, and the HE-POD technology can lift workpieces to get the best use from the worktable dimensions and to work multiple parts with a single position.